To anyone honest with themselves a literal reading of the bible, Koran for you Muslims, is not compatible with science nor is it moral. 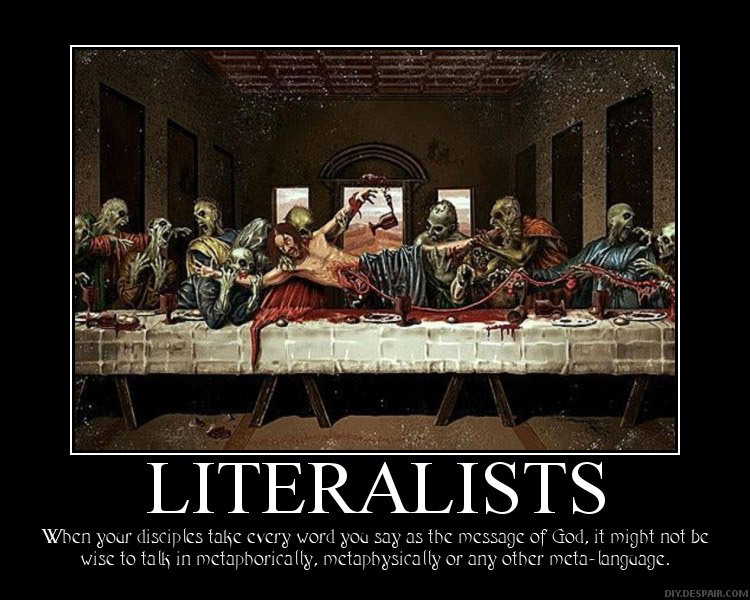 Not a small number of bible believers will counter this saying the bible should be read metaphorically. That leads to problems and quite a few of them are insurmountable.A literal reading of the Old Testament, as has been shown in The Word Of God is not only untenable but it is downright vicious and immoral to do so. A metaphorical reading while unarguably better suffers from the problem that different readers are free to interpret the same passages differently, giving themselves more importance than what they claim to be the word of god, and rendering the bible useless by doing so. If a Christian, or anyone that believs the Judaeo-Christian bible or the Muslim Koran, does not read it literally they are placing themselves above god and by doing so spitting squarely in the face of their imaginary friend. There are myriads of passages in the Old Testament promoting genocide, murder, slavery, mysogyny, homophobia and many other unsavory things. For you Christian women reading this, why don’t you give your husbands a mistress? After all it is a biblical principle. Some of you may be saying this is all from the Old Testament and now we are under the New Covenant of grace found in the New Testament. Sorry, the New Testament has it’s fair share of horrors from being read literally as this whimsical picture will point out. In case any of you missed what this picture is pointing out it is that a literal reading of the New Testament would lead to all sorts of horrific things such as canabalism, vampirism and many other ‘odd’ phenomena. Now what were those insurmountable problems I mentioned earlier? If the bible, or any religious text, is read metaphorically the meaning of the words change dependent on the reader. If man is going to ‘change’ the bible to fit his understanding[which strangely enough always corresponds with his own desires] what necessity is there for the bible or the Judaeo-Christian dogma? I am not leaving Islam out, same criticism applies to the Koran. Let me reword that, if man can metaphorically rewrite god’s word, what is the purpose of god? I really would appreciate a Christian response to my question. 11 Things The Bible Bans, But You Do Anyway. Shocking! Thou Shalt Not Touch While Dancing, Sinner! If I say “it’s raining cats and dogs,” would you understand what I’m saying? Yes but I don’t claim that you are god. If I did claim that you were god, by what right could I change your words? Fortunately the New Testament gospel accounts have been preserved. Now I disagree with the Catholic priests on this one because in fact the cup bearing the wine is only wine or grape juice and the other common element is only bread. In fact Jesus blessed these physical element in his teaching (Luke 22:17-22). What Jesus established was a perpetual memorial in His name on the first day of the Jewish Passover. Jesus became the passover Lamb during the 24 hours that he was betrayed, tried as a common criminal, crucified, died and was buried. This all happened beginning on sundown Thursday and was completed on sundown Friday. Jesus lay dead in the tomb for the entire Sabbath. He rose early on the first day of the week or Sunday because He is the Son of the living God. And this is what Christians worldwide believe today. If you care to read the book of Acts you will see that Gentile Christians were prohibited from drinking blood and eating food sacrificed to idols. Which version of the crucifixion story are you using to determine when it took place? young earth, ( And this is what Christians worldwide believe today.) do you think that because something is widely believed it is true? Hi – Since you asked for a Christian perspective…. But actually, my point isn’t particularly “Christian.” Simply that a metaphor is not subjective in it’s meaning. It’s a figure of speech that constructs an analogy between two things or ideas. “She bit my head off” = “she yelled at me suddenly” etc. But it is only a metaphor because it relates two concepts. It is not intended to mean different things to different people. It means one thing, but it says it non-literally. Love this picture. Shared it on facebook. I’ve had that idea in my head so many times when reading Jesus’ words about eating his flesh. Did you know the Romans thought the Christians were cannibals because of that passage? I’m a Christian, but I totally agree the words of Christ are hard. He himself says they are! I wrote a series of posts on the hyperbole of the Bible. No one can take the Bible literally across the board. If they say they do, they lie. Therein lies to beauty and mystery of knowing God and working out with patience and humility what He means. Christians could sure do a better job getting along with each other over it too!